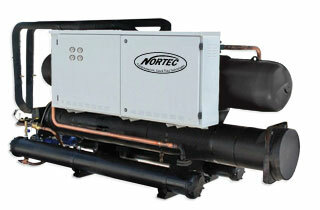 We supply the Nortec line of industrial and process chiller systems. Nortec has a high quality product line, offering many features & benefits. Nortec chillers typically come as complete packaged systems, including the chiller unit, air-cooled or water-cooled condenser, single or duplex pump station, expansion tank, no flow shutdown, auto water fill system, digital temp and controls. Chiller systems are available from 5 to 500 tons, and custom systems are designed & built to perfectly fit your specific application requirements. Air compressors, blow molding, chemical processes, compressed air, compressed gases, electronic devices, food processing, high speed rollers, hydraulic oil cooling, injection molding, lasers, natural gas chillers & dryers, machine tools, petrochemical processes, plasma cutting, press oil cooling, welders, low temperature applications. We supply systems for cooling and chilling water, glycol, brine, oil, fluids, compressed air & gas, natural gas and digester gas.